A native of Central and South America, named after the Cayenne River in French Guiana, it owes it spread around the world to Portugal whose traders carried it around the world in the 15th & 16th centuries. 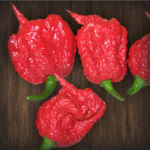 Similar in appearance to the original cayenne, this variety is twice as hot. An nice variety for pickling or eating fresh, the pods grow approximately 4in long and mature from green to red. This variety also has good resistance to root knot nematode. 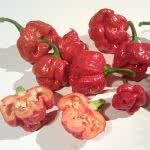 Shaped like an elongated teardrop, a mature Carolina Cayenne will be over five inches in length and about an inch in width, with wrinkled and thin skin.